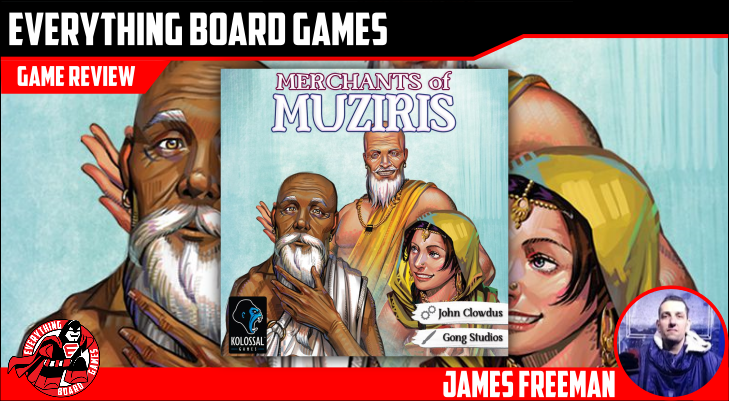 Merchants of Muziris, from designer John Clowdus, is a two-player card game where players take on the roles of merchants gathering goods from the supplier to sell at their stands. Each card features one of ten goods, each with its own scoring set and special ability. The supply will hold four goods each turn. Players will use two characters on their turn to perform actions. The Merchant will let you add a card from the supply to your hand. The Advisor allows you to activate the special ability of one of the cards in the supply. Draw more cards with the Beggar. When you’ve collected the necessary goods, use the Customer to fulfill an order. When a set number of orders have been fulfilled, players will score for their sales, add any bonuses they have received during the game, and the player with the most points is the winner. Hello Ladies and Gentlemen. I have to be honest, I had never heard of Muziris before reviewing this game. But after doing some research, I want to give you a quick overview. Muziris was an ancient harbor--possible seaport and urban center--on the Malabar Coast that dates from at least the 1st century BC, if not before it. Muziris was a key to the interactions between south India and the Persia, Middle East, North Africa, and the Mediterranean (Greeks and Romans) regions. The exact location of Muziris is not known to historians and archaeologists. It was generally speculated to be situated around present-day Kodungallur, a town near Cochin. Kodungallur in central Kerala figures prominently in the ancient history of southern India as a vibrant urban hub of the Chera rulers. Place the adviser, customer, and merchant character card face up in the middle of the play area. Shuffle the rest of the character cards and randomly select an amount that is one less than the player count (if it is a three player game add two character cards bringing you to a total of five). Any unused character cards can be returned to the box, as they will not be used. Shuffle together all the produce cards and deal two to each player face-down. This will be the players' starting hands. Deal four produce cards face up in the middle of the table forming a row either above or below the character cards. This will be for the supply. Place the remaining produce cards face-down next to the supply. Shuffle the market cards (end-game conditions) and randomly select one and place it face-up so that all players can read it. Assign each player an action token (red, blue, yellow, green). The player who last ate a mango (we also accepted had a mango drink) is given the first player marker (white) and will start the game. Everyone who is not the first player gets one coin from the supply. Merchants of Muziris is played over several rounds until the end game condition on the market card is met. Each round players take turns selecting a character card and using the ability on that card to acquire and sell produce, draw cards, or other special abilities. 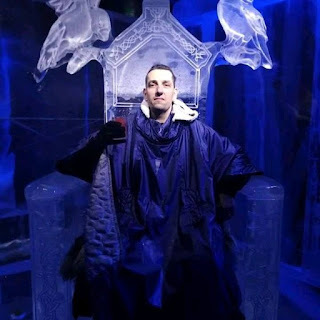 Starting with the first player, each player selects and immediately activates that merchants ability, The first player will be able to activate two abilities (the first player and their own token). Once a merchant has an action token on them, they are exhausted for the round and no one else may play an action token on them. As each player completes their turn, check to see if the end game condition on the market card has been met. If, at the end of the round, no one has reached the end game condition, Then each merchant that was not used this round gains one coin on them from the supply. Then the player to the left of the start player becomes the first player and takes the white action token and all players take their own action token back. Finally bring the supply row back up to four cards if needed. If they have triggered the market card then that player takes the market card to signal that this is the last round. All players with unused action cards may now take their turns; however, once the end game has been triggered you may use any merchant, even if they have an action token on them. Each player will then add up their coins and bonuses and the player with the most coins wins. The artwork on the merchant, player tokens, and market cards feel representative of India and its culture. I really love how the animals are drawn on the market cards and action tokens. The goods card have a very artistically painted feel to them, as if each piece was painted by hand and I'm just mad about saffron. The game works at 2, 3, or 4 players equally. I never felt the balance or flow of the game disrupted at any player count. I would like to see another token added so it could play five players. The replay ability for this game is incredibly high. The version I have has eight different character cards which equates to five different market rows. There are three different market (end game) cards which brings the game to fifteen possible variations. I also played a few times with random markets which adds even more possible setups. I love this game; it's something that can work in any game group I have, and you're constantly reevaluating your strategy based on what others players are doing. The goods have three point values--allowing you to sell--as well as an ability, which makes the cards worth different things to your overall strategy not just round to round, but from player turn to player turn. Merchants of Muziris is a game that you will learn in five minutes but never be able to master. Set collection, variable card abilities, tough choices. On KICKSTARTER now. Campaign ends February 7th, 2019.